Due to shipping restrictions, this product is not available in United States. 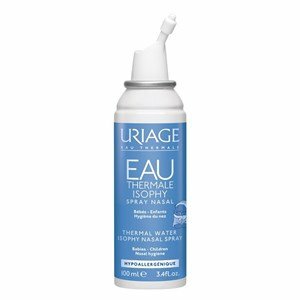 Isophy, for the daily cleaning of the eyes and nose: All the wealth and benefits of Uriage thermal water naturally isotonic, sterile, soothing, protective and moisturizing. Ultra thin spray that perfectly respects the integrity of the nose. Supplied with 2 applicators for the use by more than one family member. Spray once or twice into each nostril, to be repeated as often as necessary throughout the day. Use from 1 year of age.